Original Stories. Pulp Adventure. Oregon Grown. Happy (Late) Valentine’s Day (currently President’s Day for the pedantic of you). Scare someone you love with the cover for A Grave On Deacon’s Peak designed by artist Cristina Tanase. This gorgeous book will be in your hands in just a few short months! Wow, what a crazy year 2018 was at Dark Tidings Press (which you would know if I actually posted updates consistently…more on that below). We did our first convention, several author appearances, and launched A MEMORY OF SOLSTICE. What didn’t happen was the release of CRIES OF THE FORSAKEN, though that is cooking at the editor right now, and should be out in Feb-March. We also have started welcoming a few more authors into our ranks, though all that is hush until we get more details hammered out. Wrapping up CRIES and reading some new manuscripts has really slowed down the blogging part of this site, which I hope to get a better balance for this year. I won’t spoil too much at this time, but the general gist is that it is a secondary-world horror series set in a quasi-Europe during the Second World War. More details, including Kickstarter information, will be coming soon. We also have several Webtoon shorts to tie into the main series planned, the first of which is already in production. Once TARNISHED wraps up later this year expect to see a whole lot more of DISCORDIA. I've been quiet lately, due to a variety of factors. One of the bigger ones is the looming specter of Wizard World Comic Con coming up next weekend. Dark Tidings Press will have a booth there, selling books and giving away sample comics of Tarnished. The preperation and mental strain of this has taken a small toll on my productivity. Last month, I also spoke at schools in Umatilla, OR about being a young writer. This trip took a lot out me because it also included the funeral for my grandfather. Losing him hit me really hard, and I'm only just now working through that. My activity and general writing speed will be picking up again following the Con next week. I'll probably have another post or two about the experience, and lots of pictures! I haven't been completely hibernating, however. The next two chapters of The Northern Campaign should be out shortly, and I got some new artwork made for merchandise. 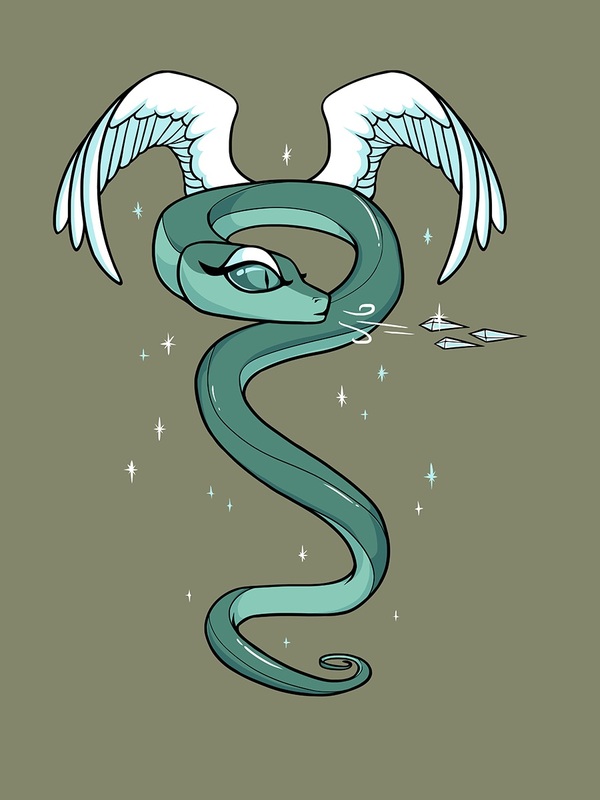 First up is a series of Chibi-inspired artwork of some of the Divine Beasts from the Gods and Men Cycle that were made by the incredibly talented DarkMoon Dancer Designs. These will probably end up on mugs and shirts, maybe stickers too! Next up is a design that I had Patrick whip up specifically for a T-Shirt. I love the image so much that I'm sure it'll find its way into a variety of places. It depicts Devin's confrontation with Akklor in the later half of Wrath of the Fallen. Enjoy. The cover for Tarnished is done! Like the rest of the book, pencils were by Patrick Buermeyer. 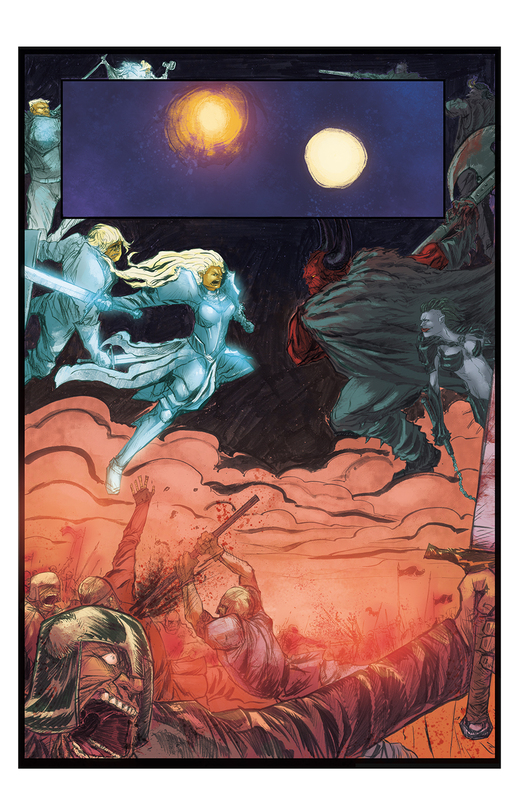 Colors for the cover were done by John Rauch. I gotta say that these two make a pretty solid team, going off of the cover for this and The Northern Campaign. Based on our current pace, Tarnished should be done by late 2018 or early 2019. Once it is, you guys are in for one helluva ride. With the upcoming release of A Memory of Solstice, it seemed time to make some adjustments to the website to reflect our growing catalog. Previously, there has been a Gods and Men Cycle tab in the navigation bar. This would take you to a drop-down menu where you could find all of the books, some information about the world, a bestiary, suggested reading order and the timeline. This all existed because The Gods and Men Cycle is a huge series with lots of interesting information and worldbuilding that I wanted to be able to share on the website. The issue is that Dark Ocean is another series that debuts with A Memory of Solstice, and it needs room to breath too. But adding another drop-down menu to the navigation bar felt cumbersome and unwieldy. It was poor site design. And this doesn't even take into account the several other series that we have planned down the road. Something had to be done. To clean up the clutter, there is a new drop-down in the navigation bar, which has replaced the Gods and Men one, titled: "Our Worlds". This lists ever series currently published by Dark Tidings Press (if it isn't a series it isn't listed). Now, when clicking on the Gods and Men Cycle tab, for instance, you are taking to a unique landing page that talks a little about the series and includes links to several of the previously mentioned pages. The background even rotates through the artwork! These landing pages are not only a functional way to cut down on the navigation bar clutter, but they are also prettier to look at thanks to the way Squarespace treats them as a microsite with their own design templates. Each series will now get a landing page that will serve as the home base for all of the links and other miscellaneous pages connected to them. You'll also notice that in this process the Artwork page that previously fell under the Gods and Men tab is now in the main navigation bar. This is because I ran out of link space on the landing page, and I decided that this page should showcase all of the amazing artwork that we get commissioned at Dark Tidings Press, not just for The Gods and Men Cycle. Other changes include changing the blog title to "New & Updates" which is more appropriate and doesn't carry the same promise of regular content that a blog does, and the addition of a submission form under the About tab. That's right, we are open to submissions now! Playing off of the same theme, I launched the Realms of Creation wiki today as well. This will replace the Bestiary and World pages for The Gods and Men Cycle, as well as contain dozens of other articles and pages covering characters, items, events, and places throughout the saga. While creating the pages for the website, I often struggled to strike the right balance of information on the pages. I didn't want to include spoilers outside of the timeline, but sometimes that left certain entries feeling lifeless. With a wiki, I can include all of the details that I want, on as many topics as I want, and readers can sift through it at their own peril. Keeping all of that separate from the main site will be very helpful overall. As to why its called the Realms of Creation wiki and not the Gods and Men Cycle wiki...well, let's just say that the High God was busy creating other worlds while on hiatus after Lio killed Xyxax. Hopefully, these changes lead to a stronger website and a more pleasant experience for all of our fans. We are currently hosting a contest on 99designs.com to create the cover for A Memory of Solstice, releasing later this year! Great work comes out of 99designs. That is where the cover for The Things That Walked Before was crafted. Designers have a limited amount of time to submit ideas, allowing the author and fans to vote and decide on which designs are the best. Then the contest moves to the final round with a few designers polishing their covers to see who makes the best one. This is where you come in! Head on over to 99designs and check out the covers. Let us know which one we should choose! I just got back some of the first colored pages for our upcoming graphic novel Tarnished. 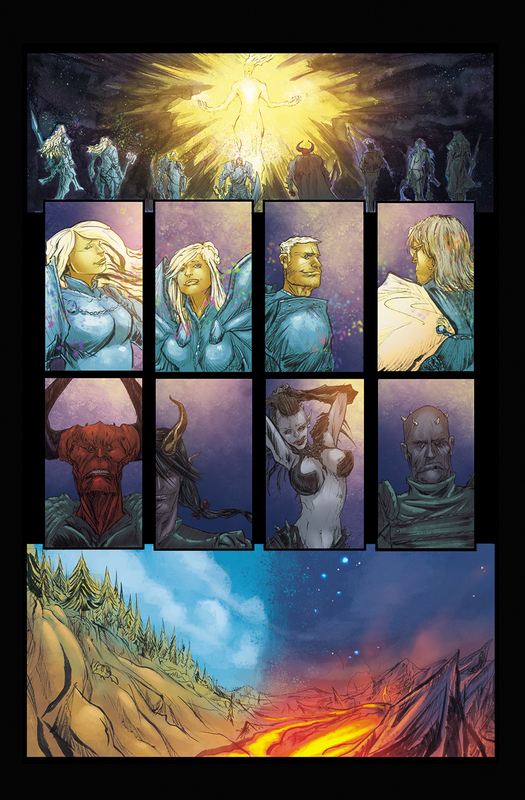 You'll recognize the imagery as the creation story as pieced together throughout Wrath of the Fallen. The lettering isn't done yet, so just sit back and enjoy some awesome art! Well...So much for posting weekly. Or monthly. Turns out this whole working dad thing cut into more of my creative time than I had anticipated (which had been a bunch). That being said, I have been working on several projects, though not all of them are getting done as quickly as I had hoped. First and foremost, THE THINGS THAT WALKED BEFORE, my Lovecraftian novel that is an adaptation of a film script I wrote in College is being tabled for the moment. The cover is done, and adapting my own screenplay feels like I am second drafting rather than first drafting, so the project should be moving on at a good clip. It isn't. Its not the story, I really like it and want to share it with the world. Its the timeline that I planned to have it finished in. THINGS was slated for an October release, and that isn't even close to being a reality. I think its a combination of the looming deadline combined with my desire to finish CRIES OF THE FORSAKEN first that ended up slowing my pace to a crawl. So, for the immediate future I am delaying this one. Its still coming, the story is mostly complete, I'm just adding some connecting prose and refining some details. When it does get done (next year?) prepare to get scared. Secondly, CRIES OF THE FORSAKEN is right on schedule. First draft is done, and Im starting my re-read/edit and then on to the second draft. It should be out by December. Milica has the cover order and should be starting on that in a month or so. The one that will come to fruition first is an original novel by a new author to the Dark Tidings Press team. I can't share too much detail on this yet as we are still in early days for the process. I am excited for this novel to say the least, and it's about time for us to publish more professional liars than just myself. The second project, which I can talk about in more detail though it wont be out for considerably longer (irony?) is a graphic novel set in the Gods and Men Cycle. Patrick Buermeyer who has been doing some monster art for us (check out the bestiary) is doing the pencils and inks. The book is tentatively titled TARNISHED. It follows the adventures of the Paladin who trained Trent, Devin, and Gil prior to the events of WRATH OF THE FALLEN as he hunts down a rogue Paladin who has started burning villages. The book will most likely be released as a single volume graphic novel in a casewrap hardcover. There is no projected date for release, at this time. Thats it for now. Stay tuned!